With a generating capacity of 22 megawatts, a 300 metre-long reservoir and a 3 kilometre long diversion channel between the dam and the turbines, Agua Zarca - being constructed by the Honduran corporation DESA - is a relatively small hydroelectric project. But for the local Lenca - indigenous peoples living in Río Blanco, between the departments of Intibucá and Santa Bárbara in western Honduras - it is big enough: the project threatens to dessicate the river Gualcarque and therewith the communal farm lands. The river is an important resource for swimming, washing and fishing, with important cultural and spiritual value. In 2015, the project was relocated to the opposite side of the Gualcarque river. Therefore, it is no longer to be built on indigenous farm lands, although these may continue to be affected by dessication. In October 2015, construction on the west side started. After the murder of Berta Caceres and other violent incidents in the beginning of 2016, the project's funding was suspended. A fact-finding mission was sent by the lenders, whose findings were expected to be published in September 2016. FMO and Finnfund declared to withdraw from the project, and their exit was finalised in July 2017. The Honduran company Desarrollos Energéticos S.A. (DESA) was created in 2008 solely for the project Agua Zarca, although community members in Río Blanco remember the first studies for the dam project dating back to 2006, when the indigenous local population and COPINH immediately expressed objections. In 2009 DESA took part in a public renewable energy solicitation bid, first for a project of only 6 MW, together with 48 other bids. In August 2010, 47 projects were granted concessions, with Agua Zarca still only accounting for 14.46 MW. DESA later on concluded a contract with the National Electricity Company, ENEE. The planned production capacity increased to 21,7 MW. The renewable energy bid has been criticized by indigenous and ecological movements, who claim it was manipulated by the private energy sector. Itt allows the privatization of natural resources including rivers. Consultations with the affected communities were not carried out. Preliminary construction began in 2011. At the beginning of 2013 the German company Voith Hydro, in a joint venture with Siemens, was contracted to provide the turbines. The vast majority of the local population has been protesting against the dam ever since becoming aware of it. In an assembly convened by the municipal mayor of Intibucá, Martiniano Dominguez, the project was rejected completely. However this did not stop the mayor from signing the contract with DESA. From 1st April of 2013 onwards there has been massive resistance in the area, including an ongoing road blockade, in spite of several violent evictions by the recently positioned military and police force, and massive repression and criminalization of the protesters and COPINH members. 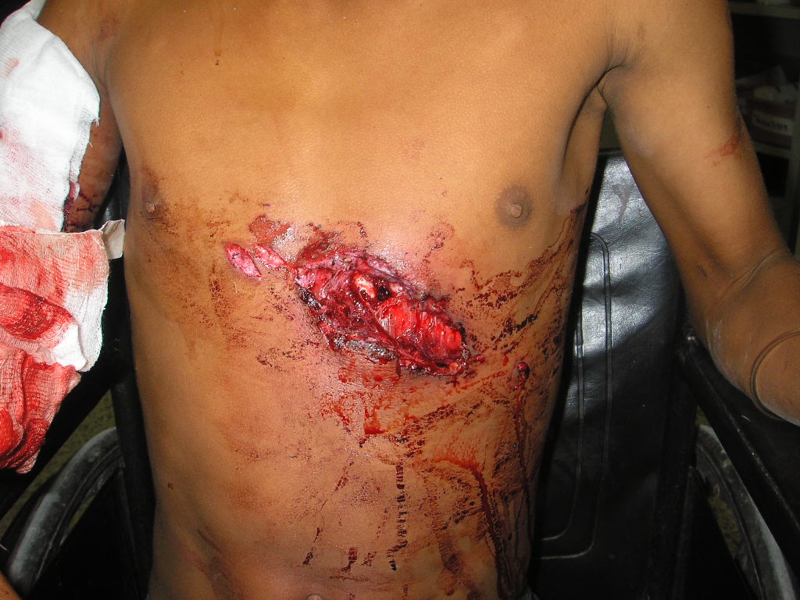 On 15th July 2013, soldiers, positioned inside the company's logistics headquarters, opened fire against peaceful local protesters and, with numerous shots from a distance of just two meters, killed the local indigenous leader Tomás García, heavily wounded his son Allan García and injured others. The responsible soldier was only sentenced to 30-90 days imprisonment, after an appeal by COPINH that followed the previous acquittal. The road blockade was maintained and kept DESA from accessing the site. In October 2015, construction suddenly began on the opposite (west) side of the river. Without being properly informed beforehand, villagers and COPINH became aware of the relocation of the project. The dam was now no longer to be built on the lands of the village of La Tejera, the community most fiercely against the project. The river would be detoured for 3 kms, exactly where La Tejera is situated. The project's website posted an outline of the plan in January. 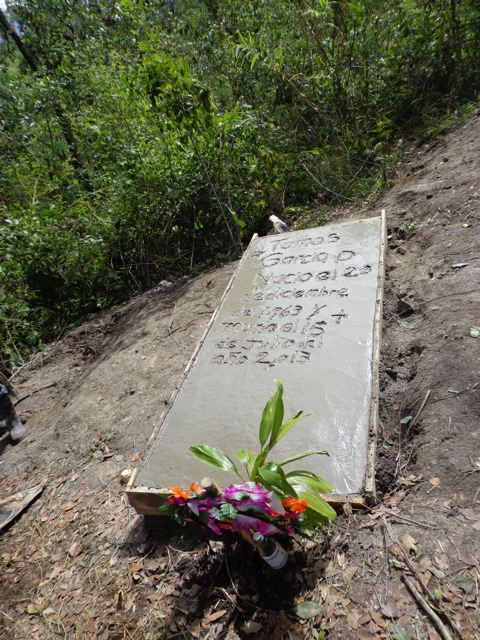 Opponents of the dam project have received many death threats over the years, especially members of COPINH and their leader and co-founder Berta Cáceres. In the night of 2nd March 2016, Berta Cáceres was murdered in her house. On 2nd May 2016, DESA's manager for social and environmental affairs was arrested as part of the investigation into the murder. As a reaction, principal financier FMO (Nederlandse Financierings-Maatschappij voor Ontwikkelingslanden) and co-funder Finnfund declared to seek to exit the project. The exit was finalised in July 2017, but critised by COPINH and other NGOs. 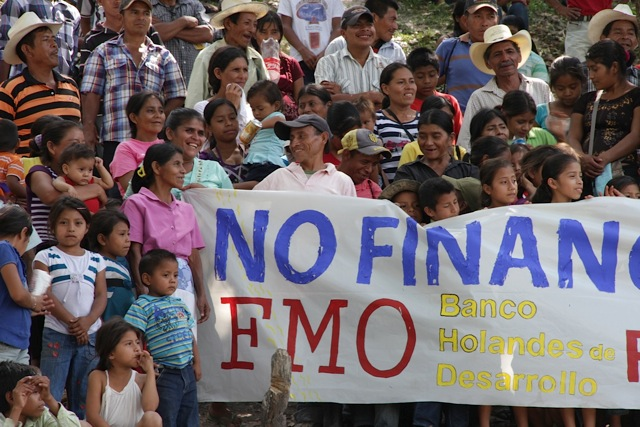 Following the death of Berta Caceres and the ongoing human rights violations all financiers (FMO, Finnfund and CABEI) must immediately terminate their support for the project and leave. UPDATE: In July 2017 FMO and Finnfund confirmed their exit from the project. See above and under updates/news. Many of the indigenous local population fear for their future and the future of their children. Although the relocation of the project prevents further destruction of their farm lands, they fear for desiccation of their lands. Since an unknown amount of water will be channeled, the village of La Tejera, one of the bigger villages in the area, may loose its access to water. Flowing water has a deep spiritual value for the Lenca population; damming and stopping this water flow means putting a barrier to the life of the river. Spiritual ceremonies are regularly held at the riverbank, which cannot be performed if the river will run dry. There has been an agreement between the mayor and DESA, in which DESA promises a couple of jobs (without detailing the number or the payment), as well as street building and maintenance and partial electrification. The connection of two communities to the main line, but not the electrification of the households. However the community rejects these token gestures and claims that these are responsibilities of the state. 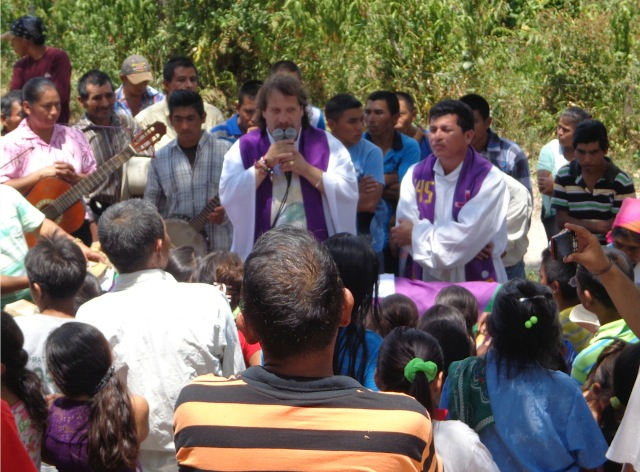 Especially the community of La Tejera, in which protest is widespread, has been socially affected by the project and has to pay a high price for their opposition. Crime and violence has risen since the project began. Infamous hitmen have been reported to be present and several villagers have been attacked and murdered under unclear circumstances. Also, conflict between communities has increased. Inhabitants of other communities are reported to be paid by DESA to guard the construction site with machetes. The heavy militarization of the region and the constant intimidation, the community reports gun shots at night, arbitrary house inspections and detentions, sexual harassment and death threats, not to mention the killing and injuring of opponents by the military in July 2013, creates a general climate of violence and fear. 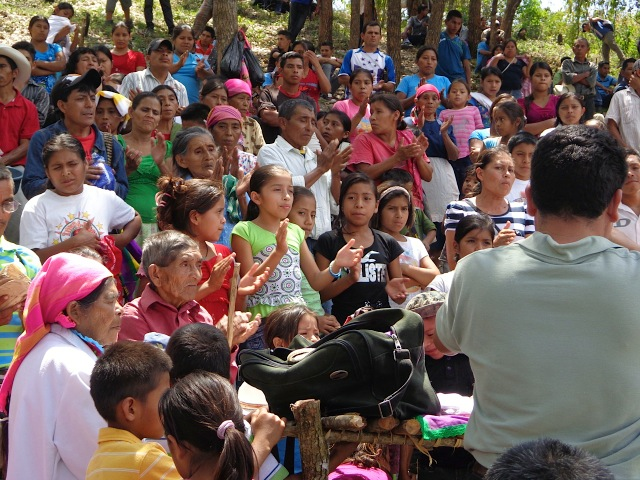 The opposition against the Agua Zarca project is seen as the most important struggle of all struggles COPINH is involved in. 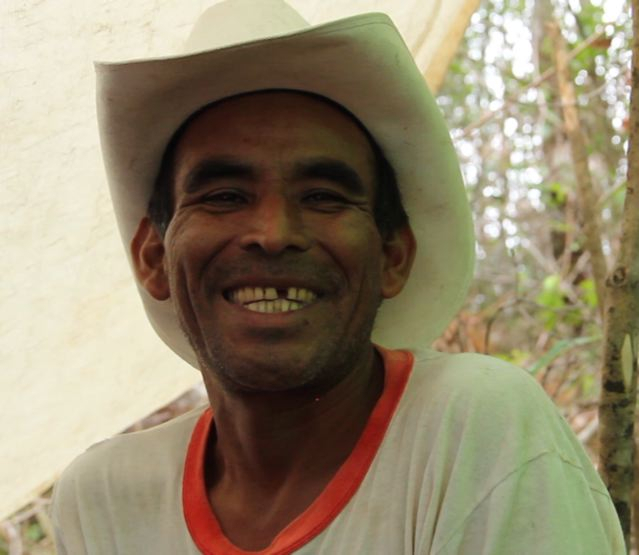 In their defense of indigenous land against 50 other megaprojects, Agua Zarca is symbolic. 'If they can build this dam, they can build anything they want', a member of COPINH stated. For the building of the 300 metre-long water reservoir, the diversion channel, the machine house and new streets to the construction site, many trees are being torn down. Several villagers fear the effect this may have on the vulnerable climate. The peasant communities are fully dependent on their corn, bean, vegetable and coffee fields. Besides, by interrupting the flow of the river, fish will be hindered from moving downstream. 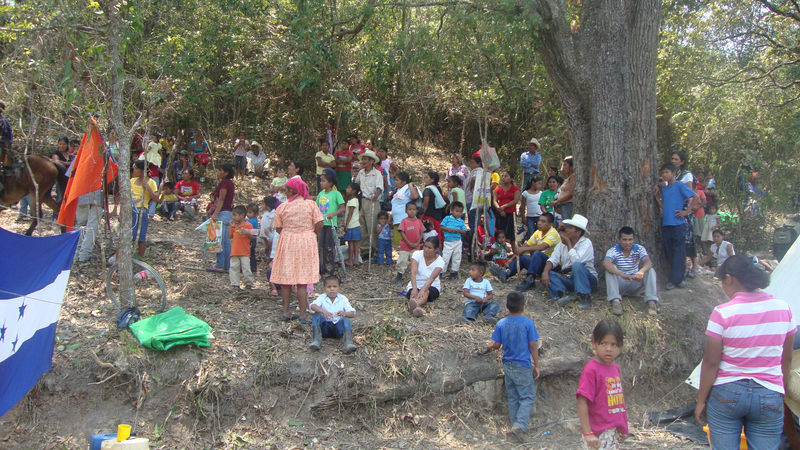 There have been constant human rights violations connected with the imposition of the Agua Zarca dam, especially the right of indigenous peoples to be consulted (free prior informed consent, FPIC) and to their land and territory, the right to free expression and to assembly, the right to physical integrity, the right to food, the right to water and the right to life, among others. Although the project was relocated, previous construction has damaged farm land, for which villagers not have been compensated. Both DESA and investors point out communal meetings which have been held, but the fact that DESA organised and facilitated these meetings disqualifies them as FPIC, as described in ILO 169. The state is not only failing to respect human rights and to assure that the company obeys them, but is actively supporting DESA by sending in the military and police force. They are based at the company's facilities, drive in the company's cars, and help out with military equipment and intimidation of the population. This creates the impression that the company has command over the military and police force. Maybe it is no coincidence that the director of DESA, David Castillo, studied in the West Point Military Academy of the US and served as the assistant of the director of the Honduran Army Intelligence. He has also worked as the Technical Director of the Honduran Energy Company ENEE right before joining DESA. Moreover, he was prosecuted for three different corruption charges while he worked for the state. 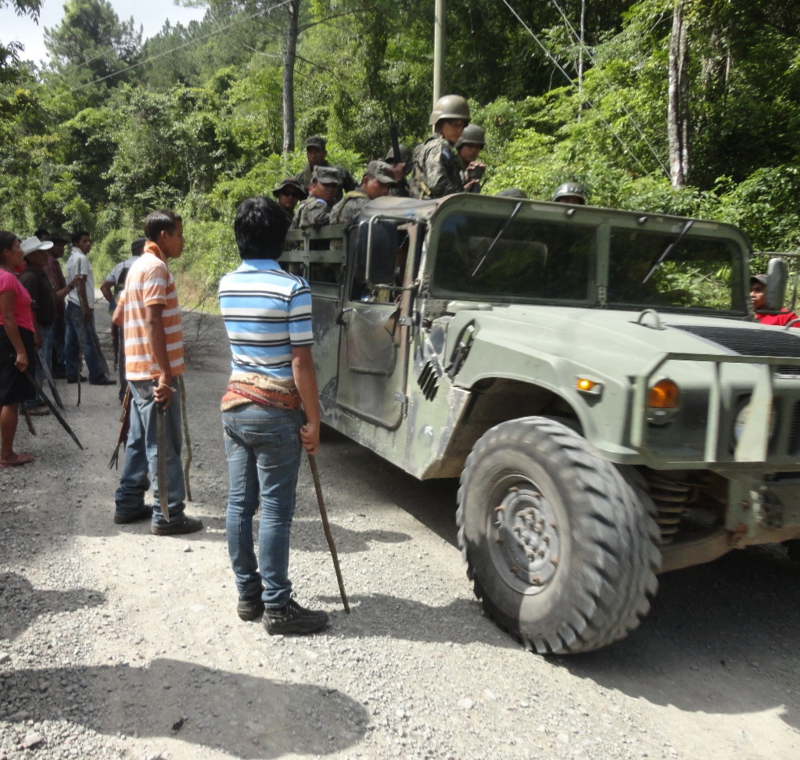 The project implementation was accompanied by the militarization of the area. Local opponents are subject to arbitrary house inspections and detentions. 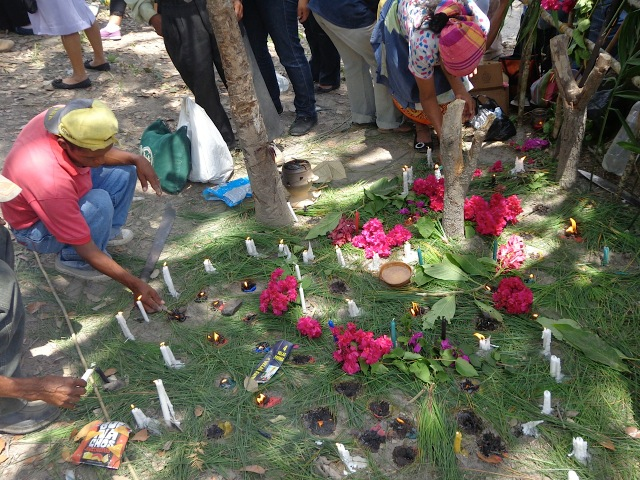 Several people have been subject to death threats: the COPINH coordinator Berta Cáceres and the other COPINH members Tomás Gomez and Aureliano Molina, also Francisco Javier Sánchez, Lucio Sánchez and others. On 24th May 2013, Berta Cáceres and Tomás Gomez were arbitrarily arrested in a military checkpoint close to the project, accused of illegally carrying a weapon - which turned out to be a military weapon which was being put in the truck bed ("paila" of the pick-up) at the checkpoint. Since then, Berta Cáceres has been subject to legal restrictions ("medidas cautelares"), even though the case has been temporarily suspended in the court. On July 15th 2013, military personnel, positioned inside the company's logistics headquarters, opened fire against peaceful local protesters and, with numerous shots from two metres distance, directly targeted and killed the local indigenous leader Tomás García. He, as COPINH members confirm, had earlier been offered money for stopping the protest, which he had refused. His son Allan García was heavily injured and several others injured. On 2nd March 2016, Berta Cáceres was murdered in her house. Over the years she received numerous death threats. She had insisted on protection by state forces, which the state refused to provide. The murder led to demonstrations in many parts of the world. Lenca women, who are usually responsible of providing the water for the family and washing the clothes, would probably suffer most from a restricted access to the river which for some represents the only water source. Harrasment of female protesters has been known to take place. DESA was created May 2009 and by November the company was participating in the energy bidding process for Agua Zarca, and by January it had signed a contract with the SERNA. When DESA was created it had an initial capital of only 25,000 Lempiras and subsequently increased its capital to 381 million Lempiras. The MACCIH spokesperson says this growth is surprising and needs to be verified. 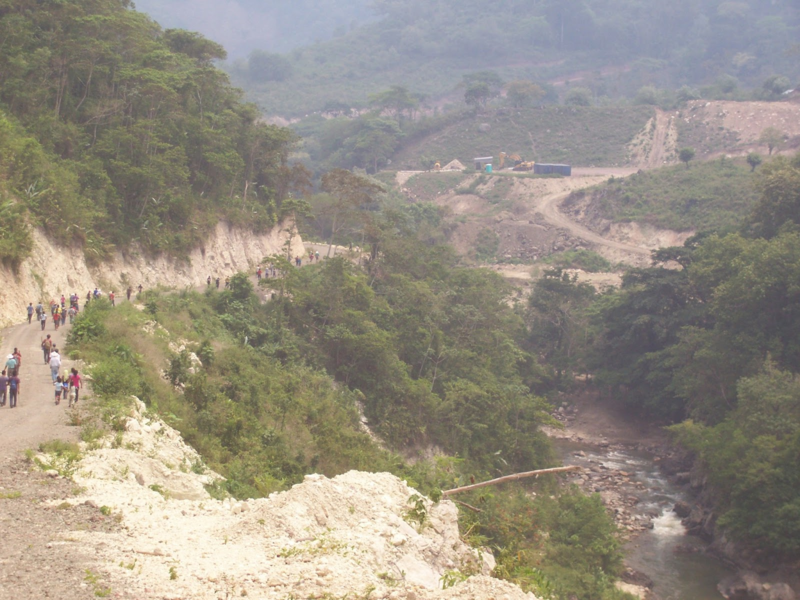 The Honduran Congress approved the contract for the sale of energy from the Agua Zarca Project on September 9, 2010, before the environmental license was even given. The Environmental License was given for 14.458 MW, but then it was amplified to 21.7 MW, which according to the MACCIH was not approved by the Honduran Congress despite the fact the increase required a commitment to purchase additional energy. SERNA Vice-Minister Dario Cardona is being prosecuted for authorizing the amplified environmental license with free, prior, and informed consultation of the Lenca people, but according to the MACCIH spokesperson, the then Minister of SERNA Rigoberto Cuellar and the Secretary General Rafael Antonio Canales are the ones who signed the license. The MACCIH spokesperson asks why former Minister Rigoberto Cuellar has not been charged. He is the current Assistant Attorney General (rough translation of Fiscal Adjunto) of the Public Ministry, the institution that prosecutes the cases. Construction of the Agua Zarca hydroelectric project on the Gualcarque river has been finally suspended, reports Prensa Latina. This follows the completion of FMO and Finnfund withdrawing their finance for the project. 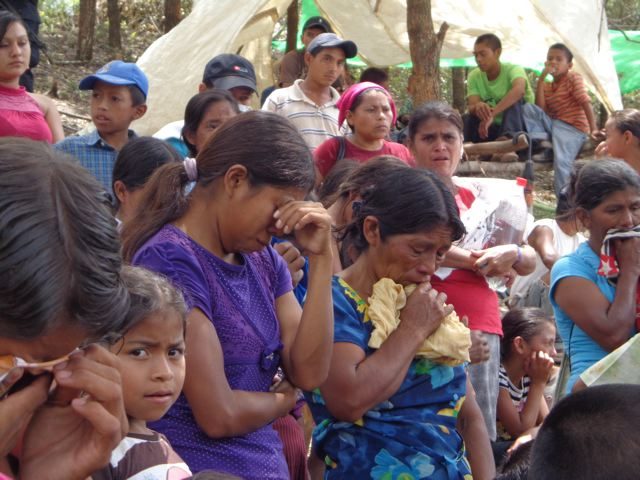 Copinh asks that FMO and Finnfund accept their responsibility for the killings and human rights violations that were triggered by the Agua Zarca project. 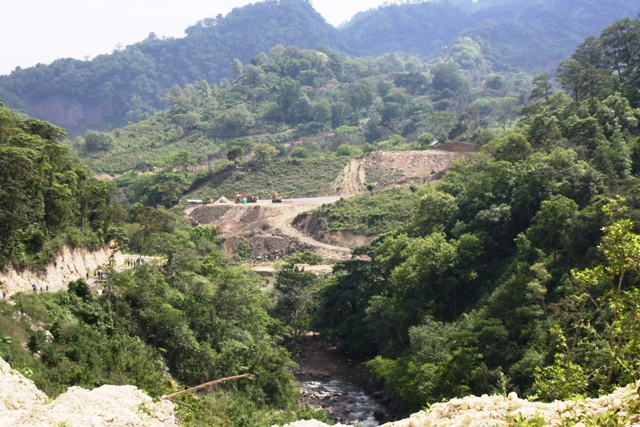 Two of the lenders of the Agua Zarca hydropower project in Honduras, FMO (Netherlands Development Finance Institution), Finnfund (Finnish Fund for Industrial Cooperation), together with owner and developer DESA, mutually agreed to end their existing contractual relations source FMO). 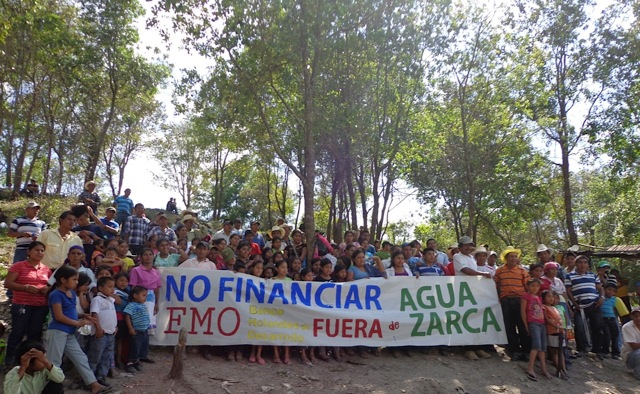 FinnFund has announced its intentions to end its involvement in the Agua Zarca project (source FinnFund). 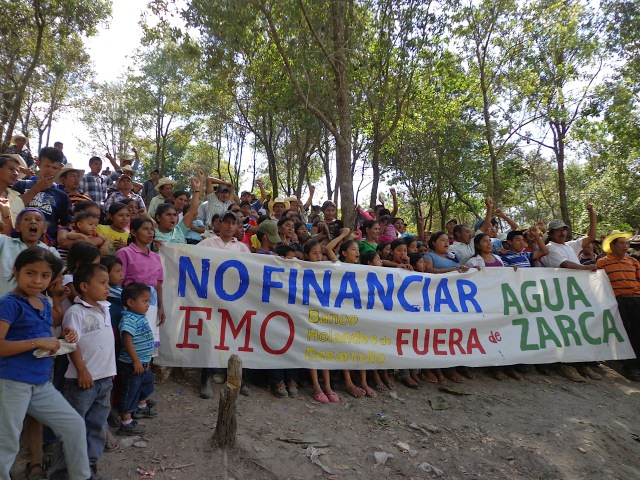 FMO has announced its intention to end its involvement in the Agua Zarca project (source FMO). Honduras authorities captured four men for the March murder of activist Berta Cáceres, two of which have direct ties to the hydroelectric company she and others have been battling in western Honduras, and indicated there may have been a larger conspiracy at play. On May 2, Honduran police arrested four people in connection with the murder of Cáceres, an environmental and indigenous rights activist who spent a decade fighting to block construction of dams along the Gualcarque River in La Esperanza, Honduras, about a 100 kilometers from the capital, Tegucigalpa (source Insightcrime.org). Statement from DESA on the arrest related to the murder of Berta Caceres. On 2nd May 2016, the Honduran police arrested four people as part of the investigiation into the murder of Berta Cáceres. One of them is DESA's manager for social and environmental affairs. 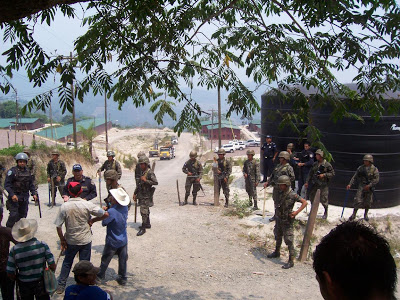 Following the murder of Nelson García FMO and subsequently Finnfund suspend their financing for the Agua Zarca project, The Huffington Post reported. Thursday March 3th, Berta Cáceres was assassinated by gunmen, who shot her four times inside her home in La Esperanza, Honduras. 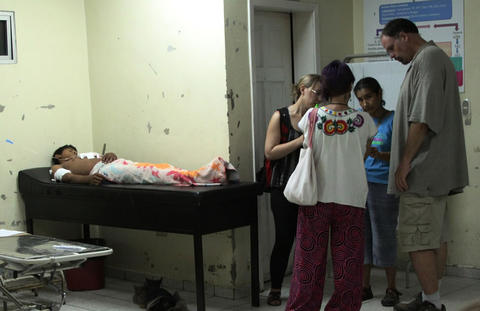 Gustavo Castro Soto, a Mexican human rights activist, was also wounded in the attack, and he is now a protected witness. Berta Cáceres was the coordinator and co-founder (in 1993) of the indigenous organisation Council of Indigenous Peoples of Honduras (COPINH), a human rights defender, and leader of the Lenca Indigenous community. She has been repeatedly threatened with her life for her opposition against the Agua Zarca Dam, complaining of death threats from the police, the army and landowners's groups. Last year, the Inter-American Human Rights Commission had ordered protective measures for Berta Cáceres, but she was not under protection this Thursday. In 2015, Berta Cáceres accepted the Goldman Environmental Prize for her role in fighting the Agua Zarca dam and her work to defend the Gualcarque River. She fought against the dam by filling legal complaints, organising community meetings, and bringing the case to the Inter-American Human Rights Commission. More than a hundred people were on their way to San Francisco de Ojuera, to march to the construction site from the side on Santa Barbara. Before arriving in San Fransisco, the busses were stopped, people were hauled away from the busses, intimidated and threatened. Arriving in San Fransisco took five hours of walking. Another attack on April 6th led to two dead and many heavily injured persons in Río Blanco. According to the indigenous organization COPINH, five people who are known as dam supporters - one of them a known hitman in the region - attacked two members of COPINH who were on their way to the field work. In the following struggle, those two and others were heavily injured, two of the attackers died. COPINH decidedly repudiate the media campaign which aims to criminalize COPINH and describe the situation as if COPINH members had attacked two peaceful dam workers. 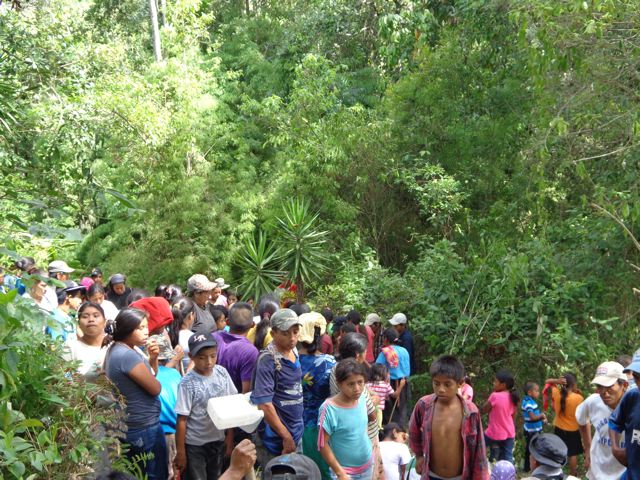 Ever since opposition against the Agua Zarca started, the indigenous protest has been criminalized and repressed. as a result, communities have been divided and violence has increased dramatically. 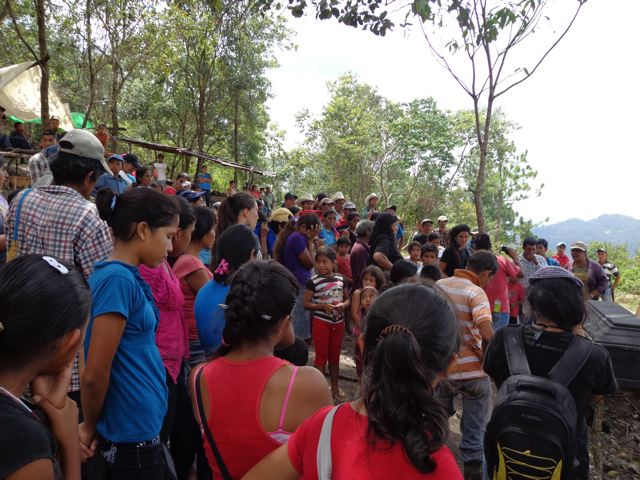 On April 1st, members of the indigenous council of Río Blanco, who are part of the bigger indigenous organization COPINH, celebrate their first anniversary of resistance against Agua Zarca. A year ago, the communities had started a road block to hinder the machines from accessing to the construction site. In the event, they also remembered their comrades who have died and who have goten heavily injured as consequence of their peacful opposition. The occasion was also used to formulate a letter in which they demanded that the dutch bank FMO should quit financing the project. On March 5th, María Santos Domínguez, a leader in the local indigenous council of Río Blanco and member of the indigenous organization COPINH, one of the most visible opponents of Agua Zarca, was attacked on her way home by seven men who were armed with machetes. Her husband and 12-year-old son, who came to her rescue, were attacked as well, leaving all three of them heavily injured. One of the attackers, Mr. Fausto Domínguez, died as a result from injuries resulting from the attack. Violence has dramatically risen since the imposition of the hydroelectric dam. Dutch development bank FMO has confirmed in a letter to BankTrack that it will support the construction of the Agua Zarca dam, this despite the widespread local and international opposition agaisnt this project. The IFC has confirmed it is no longer investing DESA as they conclude it does not comply with their mandate (see their report here). Synohydro has confirmed that it has terminated its contract with DESA, citing ongoing dispute with local communities. In the court audience the 20th of September, the coordinator of COPINH Berta Cáceres was convicted with a preventive detention and the other two indigenous leaders Aureliano Molina and Tomas Membreno were dictaded substitute measures (not returning to the Río Blanco region where the dam is being built, reporting every second week to the police station and remaining under custody of the lawyer). Also, the judge ordered eviction of the road block which the indigenous people of Río Blanco had been maintaining since the 1st of April. The results of the court audience are exactly what the company DESA and the Attorney General had asked for, falsely accusing the three indigenous leaders of usurpation, co-actions and continuous damage in prejudice of DESA. While this means a hard stroke for the indigenous movement, COPINH and the local population remain determined in their struggle against the hidroelectric project. Also, national and international solidarity is raising. There are no results yet of the hearing against the members of COPINH Tomás Gomez, Berta Cáceres, and Aureliano Molina which took place the 12th and 13th of September.The judge will render her verdict after the third hearing, which will be held Friday, September 20th. There are four total charges against the three, not all of which are being heard at this time.The government is requesting that the three be imprisoned. Meanwhile, the police presence in the north of the department of Intibucá, including the village of Rio Blanco, has increased. So have government threats and harassment of those resisting invasion of their lands. Another COPINH member was arrested last week on charges of being a danger to the well-being of the nation. First day of court cases against three leaders of Copinh, charged with inflicting damage on property of DESA and disturbing public order. 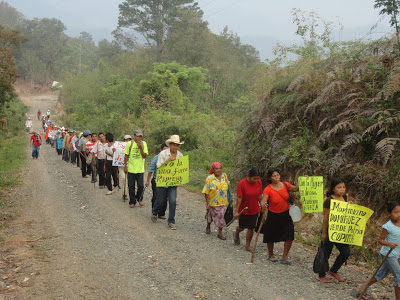 On 12th and 13th August 2013, the court audience against the three COPINH leaders Berta Cáceres and the other COPINH members Tomás Gomez and Aureliano Molina took place. They are falsely accused by DESA of usurpation, co-actions and continuous damage in prejudice of DESA, as well as of being the intellectual assassins of a community member. This all is part of a campaign of criminalization of the protest which could lead to the politically motivated imprisonment. Since the hearing in August, the accused must report every week to the court, and are not able to enter the area of the incidents (i.e. the dam protest site). The next and final hearing is scheduled for the 12th and 13th of September. See report here. Total project costs are around USD 64 million. The lead company behind the Agua Zarca dam. They operated as main constructor of the project until the end of 2014. Conducted Enironmental & Social Appraisal report in June 2012 and a Due Dilligence report in 2014. Hired by FMO to conduct a Social Site Assessment in June 2014 and Quarterly Monitoring Reports on DESA from 2015 onwards. Provider of technical advise for Agua Zarca. Contracted to provide turbines for Agua Zarca. DESA Killed Berta! Capture the people who gave the orders! Is GDF’s green bond issue really green? Hear from SOA Watch activantes in Honduras as they talk to people on the ground, and help bring to light the reality of the political and social turmoil in the post-coup nation that has come to be known as the "most violent in the world".